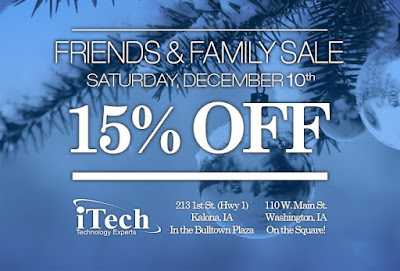 Technology Services of Iowa, LLC: You're Invited - Friends and Family Sale!! You're Invited - Friends and Family Sale!! We appreciate your business throughout the year and would like to extend our employee discount to you during this holiday season. Saturday, December 10th, iTech stores will open at 9 AM for a special private friends and family shopping event and YOU are invited! Shop for all the electronic items on your Christmas lists! HDTVs, digital music players, digital cameras and accessories, phones, Bluetooth headsets, surround sound, sound bars, computer accessories, RC toys, and so much more! Save 15% off regular pricing…..AWESOME time to SAVE!!! **Some product exclusions, please see store for details. 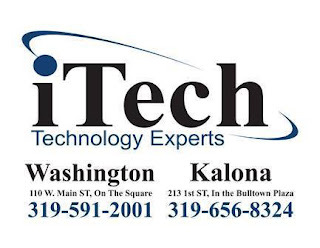 To participate: Mention Friends and Family, Print or show this email to Kalona or Washington iTech staff on Saturday, Dec. 10th or it will be your ticket to exclusive pricing! Be sure to share this invitation with your co-workers, friends, and family…….Your Friends are OUR Friends!! See you Saturday! Your friends at iTech.